The Schuco contemporary sliding door is arguably the best there is. With gorgeous design, exemplary engineering and features you won’t find on many other doors, it’s the ultimate sliding door. Schuco sliding doors feature high thermal insulation, ultra slim sight lines and the biggest expanses of glass. Extend your space and add a wow factor to your home with a Schuco sliding door. The finest Schuco sliding doors bringing style and individuality to your home. So what is it about Schuco doors that makes them so impressive? 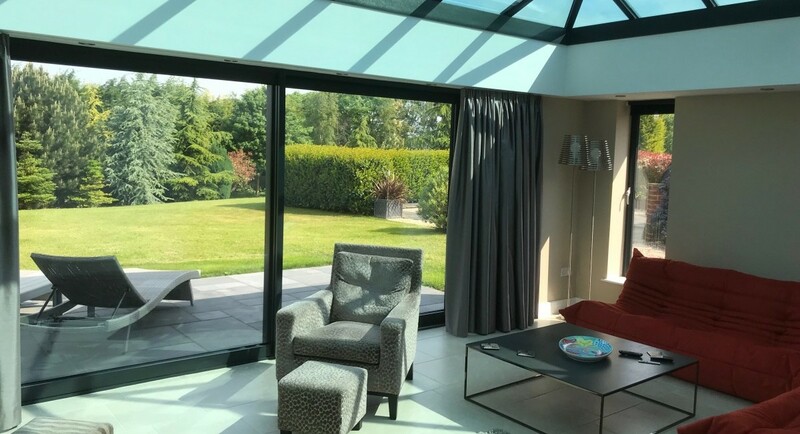 For over fifty years, Schuco has provided its superior sliding doors to some of the finest homes and to those that seek what is regarded as one of the finest sliding doors. It brings total design freedom to your home and does far more than any other standard sliding door. The most flexible opening options for sliding doors. Open automatically at the touch of a button. Even with it’s ultra slim profiles and contemporary aesthetics, Schuco doors can be made wider and taller than many others. Heights and widths per panel of up to 3 metres or more are possible depending upon the design. Therefore if you’re looking to create the dream extension or are looking for the ultimate in glass sliding walls, Schuco can achieve this. With a choice of profiles and many opening options, you’ve never had a better sliding door. Our Schuco doors feature single, double or even triple tracks. This enables multiple panels to slide in one or both directions as well as in front or behind each other. For larger openings, the triple track brings all the doors neatly stacked on the one side maximising your open space. 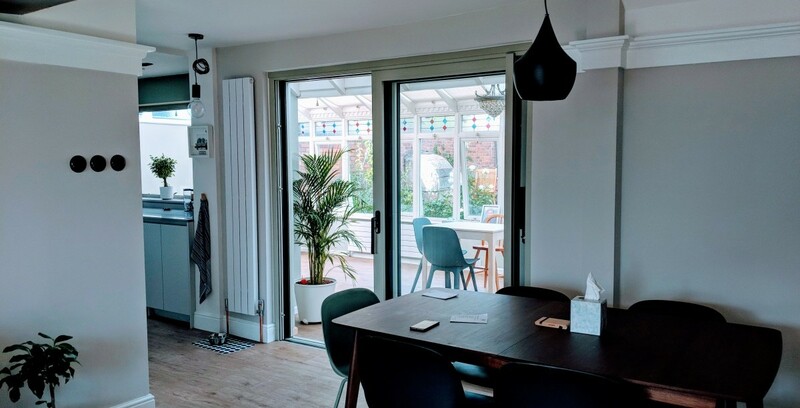 Should you wish you can even construct your home or extension so that the sliding doors have fully open corner and have all panels sliding into a wall disappearing from view altogether. Schuco doors are one of the few around that can truly be in harmony with the inside and outside of your modern home. All these impressive features can also be incorporated into standard size doors not just bespoke constructions. If you’ve an old metal or timber sliding door and are looking for the latest generation product, Schuco will be right for you. Sliding doors with advanced hardware and ultra light operation. Thanks to the highly engineered running gear, heavy duty rollers, great design and superior engineering, even the largest doors are smooth and light in their operation. The handles are the finest quality being distinctive, bolt and current. Security is at it’s highest level with Schuco doors having passed the most stringest burglar resistant tests. Built in are many features to prevent prising the doors open, lifting them out of the frame and forcing entry. Should you choose the automatic sliding option, doors have built in safety devices to prevent accidental closing and also feature remote monitoring to confirm that they’re closed and securely shut. A choice of frame profiles and low threshold options. Another feature found in Schuco sliding doors is a choice of frame profiles to suit the size of the door. You also benefit from one of the best low threshold options that is also weather rated. Superior Thermal efficiently in an aluminium sliding door. Despite the slim frames and large glass area, Schuco doors can give U Values of under 1.5 W/m2K depending upon the glass specification chosen. With glass being the largest component in any sliding door this ensures your doors will save energy and help lower your heating bills. A higher insulated version of the door is also available with even more impressive U Values. So as you can see, our exceptional Schuco sliding door gives you more than other doors on the market. Contact us today or visit our showroom. The Schuco sliding doors is a high engineered product installed in the finest homes and buildings. Ultra slim profiles from 88mm to 108mm. One of the slimmest doors available. 3metre by 3 metre sliding panels can be constructed for sliding glass walls. A large range of colour options. Lift and slide or tilt and slide options available. Superior weather performance and burglar resistance. Glass specification matches the high specification aluminium framing. Glass is designed to offer low U values with double glazed or triple glazing options available. Low e glazing for solar control and to retain heat in the building. Toughened glass as standard or laminated glass upgrade available. Schuco sliding doors come in a wide range of powder coated and metallic colours. Over 200 colours are available in satin, matt or gloss finishes. Dual colour options are available giving different colours inside and out. There are also upgrades for marine, chlorine and severe weather locations.